Intravascular papillary endothelial hyperplasia (IPEH) or Masson tumour is a non-neoplastic reactive entity. It accounts for approximately 2% of vascular tumours involving the skin and soft tissue1. However, it is an extremely rare intracranial entity with less than 40 cases reported in the literature2. Interestingly, intracranial IPEH has been reported following stereotactic radiosurgery (SRS) in the brain3. Hence the incidence of this condition may rise with increased utilization of SRS in treatment of intracranial tumours and therefore it is important to be aware of this entity and the imaging locations/appearances of which can vary. To describe a case of intracranial IPEH that occurred at our institution and to provide an overview of this condition. 1. Description of the clinical, histological and radiological aspects of a case seen at our institution. 2. Clinical and imaging characteristics of patients that have been reported in the literature with intracranial Masson tumour will be discussed. To describe a case of intracranial IPEH and to provide an overview of this condition including the clinical, radiological and histological aspects at our institution and in the literature. References: 1. Boukovalas S, Dillard R, Qiu S, Cole EL. Intravascular Papillary Endothelial Hyperplasia (Masson’s Tumor): Diagnosis the Plastic Surgeon Should Be Aware of. Plastic and Reconstructive Surgery Global Open. 2017;5(1). 2. Perez Prat, Gustau et al. Staged Management of Intracranial Masson Tumor: An Unexpected Gauntlet: Case Report and Review of the Literature. World Neurosurgery, June 2018; 114, 194 – 203. 3. Karamchandani J et al. Extravascular papillary endothelial hyperplasia mimicking neoplasm after radiosurgery: case report. Neurosurgery - April 2012; 70 (4). 4. Salaud C, Loussouarn D, Buffenoir K, et al. 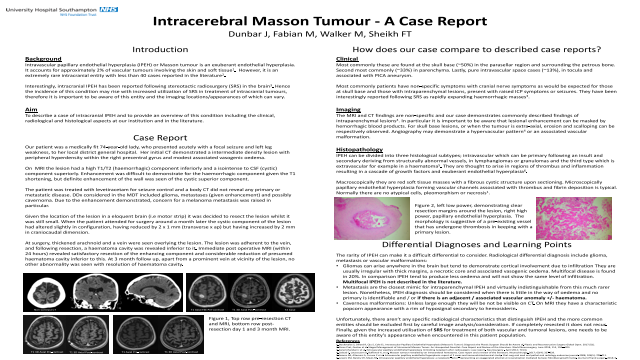 Masson tumour revealed by an intracerebral hematoma. Case report and a review of the literature. Neurochirurgie. 2017; 63(4): 327-329. 5. Soares AB, Altemani A, Furuse C et al. Intravascular papillary endothelial hyperplasia: report of 2 cases and immunohistochemical study. Oral surg oral med oral pathol oral radiology endocrine journal. 2008; 106(5): 708-711.